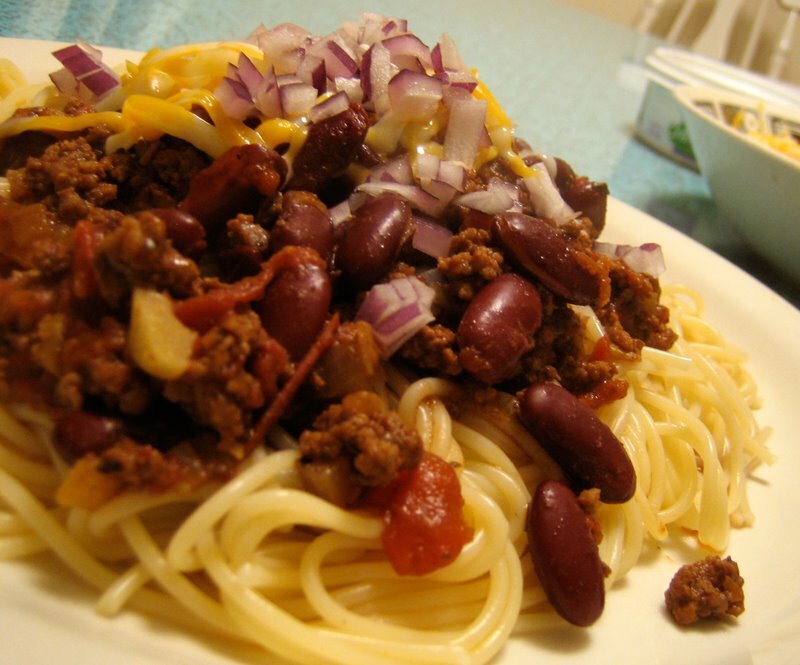 Why is this post called “totally not Cincinnati chili”? Well, for one, I’ve never been to Cincinnati nor have I had the real deal. The people of Cincinnati are very passionate about their chili and I certainly wouldn’t want to get into fisticuffs over this post. 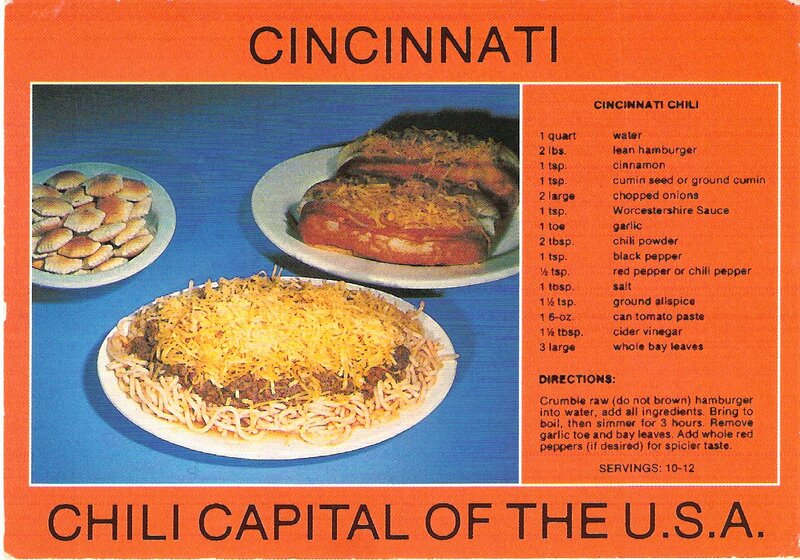 Cincinnati has more chili parlours than any other city in the States and they serve their chili over top of spaghetti or eaten with oyster crackers, raw diced onions, kidney beans and mounds of grated cheese. But the spices here are what makes this chili unique. Chocolate, cinnamon, cloves, allspice all combine to make a winning mediterranian-inspired combination. To be truely authentic, I would have to finely grind my own meat and then boil, rather than brown it. Also, there would be no kidney beans in the chili, rather, they’d be served over top along with the other toppings. Whatever, this chili rocked. After having his first bowl, Cornelius said that all chili should be served over top of spaghetti and I think I have to agree with him. The chili alone was good, but over top of thin spaghetti, it took it to a whole new level. And the addition of diced raw onion over top? It was delicious! This will definitely make an appearance again and I can easily see a veggie ground round substituted for the ground beef. Not traditional, but who cares! My standard chili recipe is here. I used to make it with ground chicken, but now I usually use a veggie ground round instead. It’s delicious and it also has cocoa powder added for depth. Brown ground beef in the olive oil, along with the onions, garlic and chili powder. When meat is mostly browned, add in remaining ingredients except the kidney beans and bring to a boil. Turn down heat and simmer uncovered for about an 1 hour. Add in kidney beans and simmer on low for another half hour. 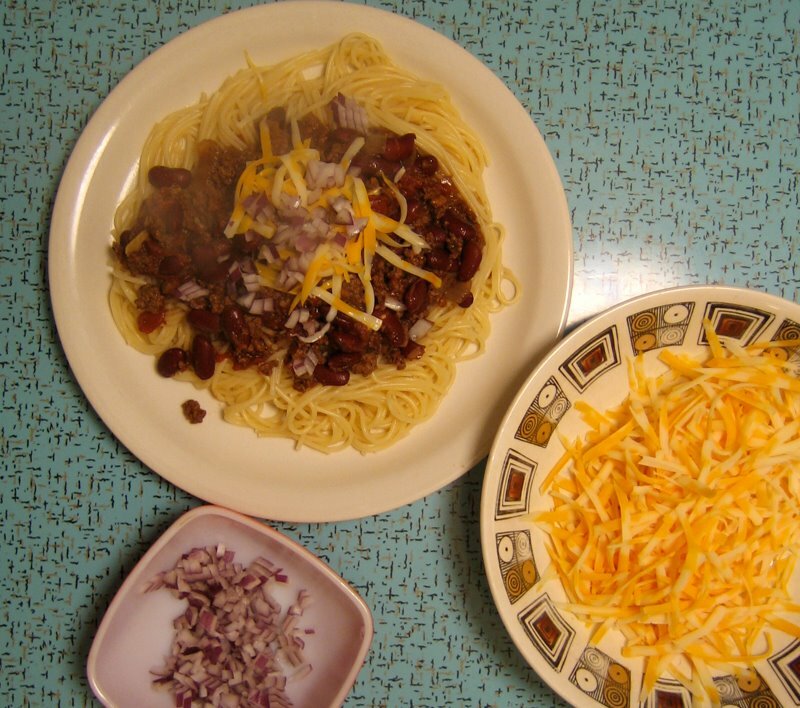 Serve over spaghetti and top with grated cheese and diced onion. that looks SO yummy… ‘course I’d have to make mine with veggie meat but whatever – it’ll taste just as delicious. p.s. I have you linked on my blog. I love the recipes you feature. The first time I had chili over spaghetti with cheese and onions was at a Bobs Big Boy in San Jose California! I’ve been eating it that way ever since 🙂 Your version of the chili sounds great. Yum, chili spaghetti! Great comfort food. 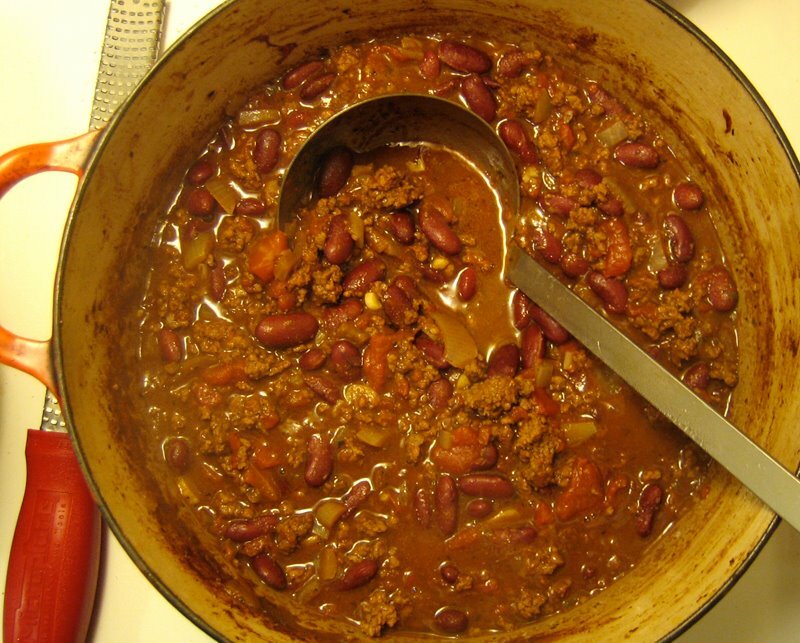 I made chili for 40 last weekend and we had leftovers…wish I would have though to serve it over spaghetti!! Love the added cocoa. I’ve though about tossing chocolate chips in–why not? I’ve been to Skyline Chili once in my life (in Cincinnati) and I swear I have cravings for after just that one time. Although it really ups the unhealthy quotient, nothing beats a hot dog covered in chili and cheese. Oh yum! Wow, growing up in Texas I always fancied myself something of a chili connoisseur, but I have never heard of chili on top of spaghetti! Not a bad idea. Who knew Cincinnati had a thing for chili!? I am so hungry right now but have been battling a cold bug since yesterday, so I’m keeping it simple with the food I eat today…no cooking involved just pickles, tea, brown rice crackers, hummus, oat cakes…I’ll have to try this out at a later date. (doh! )…because it looks very yummy…I’ve made your other chili recipe before, the one with the cocoa, and it rocks! Your recipe is close enough for this Cincinnatian, but then, I make mine vegetarian, use black beans instead of kidney, and use red onions instead of yellow. And when I go to the Skyline around the corner from here, I substitute their (similarly spiced) rice & beans mixture for chili. So I'm not going to going to win any tradition contests. Agree with Cornelius, I now prefer all chili over spaghetti. I also tend to toss in a little cocoa powder to any random made-up chili experiment. It just makes it taste more interesting and hearty, I think. I’m from Hawaii, and we eat chili on top of rice. You should try it sometime! Pattie, i’m sure it would be just fine and as delicious with a veggie ground! Dawn, it’s totally comforting and delicious. Beans and feta and hot peppers? So not boring! Mrs. L, it’s a great way to eat chili! Alisa, it is total comfort. Aimee, adding chocolate chips would be so good! Naomni, I had heard about it years ago and this is the first time I’ve made it. I’ll definitely be making it again. Culinary, well, I guess I’ll have to make a trip to cincinnati! Laura, it’s delicious. Trust me! Elizabeth, good to know from a Cincinnatian! The, that’s how we usually eat our chili too, over rice. This is a nice change. That chili looks really tasty! I’d be going the veggie route on this (but keeping all those other flavours) and big thumbs up for the raw red onion on top, love that. Made it tonight with a few minor substitutions. It was SO good. I loved the cocoa and spices. I love a good pot of chili with all the fixings. Cheddar, pasta, sour cream, and a side of cornbread. Looks great!! I’ve been eyeing many of your recipes and just have a question — how many servings are your recipes generally for? This sounds particularly delicious given the snowy weather we’ve had the last two days. I like the idea of noodles with chili. Way more fun than rice or potatoes! We made it for supper tonight. Totally tasty and pretty darn simple! Elizabeth, looks like a great recipe! Good to know that eating chili and spaghetti together isn't just a regional thing! Thanks Daily Spud, I think it would be great veggie-fied! Glad you enjoyed it, Carole! Ashley, I hope you do. It's good. EAT!, definitely, but I think I'll be passing on the cornbread from now on…I like spaghetti better! Denise, there's just 2 of us, but I love leftovers. I'd say most of my recipes are geared for 4 people or so. I never really pay attention to servings, hence the lack of that in my blog! Brie, this is perfect for this stupid March snowy weather! Anne & Paul, so glad you loved it!! Thanks for the shout out to Cincinnati! I was born and raised and miss it much from time to time. The chili looks fab. I make a similiar one and chili is so gooooood over a mound of pasta with heaps of cheese (as finely grated as possible) on top! Nicole, glad you approve! I loved this chili and I think I’ll be making it like this from now on. This looks UNBELIEVABLE. My husband makes fantastic chili, but I definitely will be giving him this recipe to try in the next few weeks! It looks great! Made me decide for sure I was making chili this weekend! I have been craving it for awhile. As much of as pasta fan that I am, I am not a fan of chili on spaghetti though – only because the spaghetti noodles don’t hold onto the beans. being part Asian, I grew up with my dad putting chili over rice. That is kind of my habit. There was a chili place I used to go to that had all kinds of extra toppings for their chili, I miss that place. Thanks for the incentiove to cook chili! Denise, I also grew up eating chili and rice, but I admit to liking this more!